“Panta rhei – Everything flows“ is the motto of a new star on the banks of the Weser river in Bremen: the 82-metre-high Weser Tower. 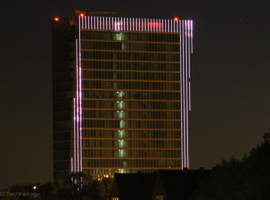 On the 7th December 2010, star architect Helmut Jahn of Chicago and lighting artist Yann Kersalé of Paris pushed the switch that turned on the illuminations on the façade of the highest office block in Bremen. 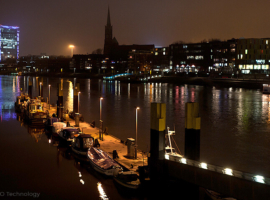 From their vantage point in the Weserburg museum, the pair had a magnificent view – when the fog finally lifted – of the illuminations marking the official opening of the Weser Tower in the heart of the Weser quarter of Bremen’s Überseestadt district. 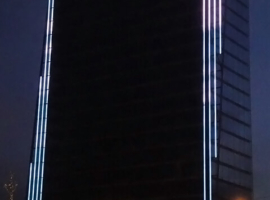 The 700 metres of LED strips were installed on the glass exterior facade of the office block during the summer. The modern, ecologically sound building complex is Bremen’s latest landmark and symbolizes the transparency and openness to the world of the Hanseatic city. 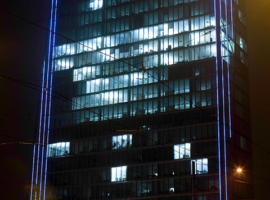 The dynamic architecture of the 22-storey building is crowned by a work by the French lighting artist Yann Kersalé entitled “La Rivière Source”. 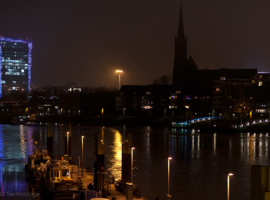 Since the dedication, the ripples of the Weser below have been echoed by the façade of the tower – an effect achieved through the use of light-emitting diodes (LEDs). 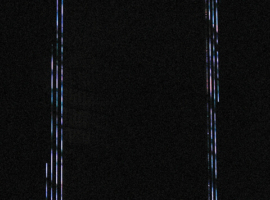 The movement of the waves is captured by a camera and the digital data transferred by Internet to the computer controlling the LED strips that frame the glass façade of the tower. These mirror the movement of the waves, producing a blue, glimmering light-show that is triggered by the onset of darkness. It is a highly unusual illumination, unlike any currently to be seen in Bremen, and it draws the eye of the onlooker towards the Weser embankment. This project demonstrates the expertise of the service provider A&O Technology in the field of architectural lighting with LED technology. 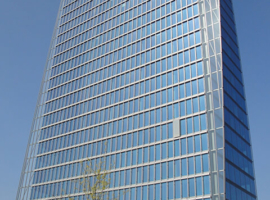 The culmination of a long process of selection, A&O Technology was awarded the contract for the realisation of the fixed installation on the outer façade of the Weser Tower back in 2009. 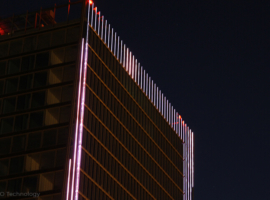 Because of their quality, A&O opted for special, video-capable LED strips designed and manufactured in Germany. With a light intensity of 45000 mcd, the strips, which were specially designed for outdoor applications, combine a particularly high level of brightness with the low energy consumption typical of LED technology. 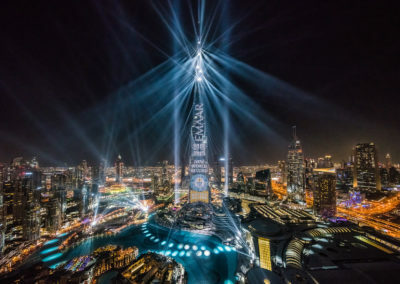 This product, which was selected by A&O, soon manifested its superiority over the products of other well-known manufacturers, convincing in the process not only the customer but also the French artist Yann Kersalé, who created the lighitng design at the behest of the tower’s owners. 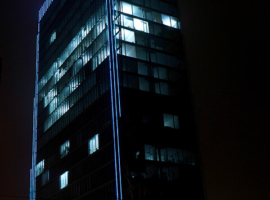 The 82 metres high office tower was equipped with a permanent installation with LED strips. The project was implemented by A&O Technology Germany..